Professional moisture measuring device for wood and building moisture. Material groups: selection of various material groups (wood and building materials) increase the device’s measuring accuracy for materialspecific measurements. All measurement results at a glance: all relevant information (material, measurement value, bar display, wet-dry indicator, MIN/MAX) is visible simultaneously on the large, illuminated LC display. Wet-dry indicator: wet-dry evaluation of measurement results provided by bar display. Stable, ergonomic housing with protective rubber casing makes it easier to insert the spikes, particularly in hard materials. 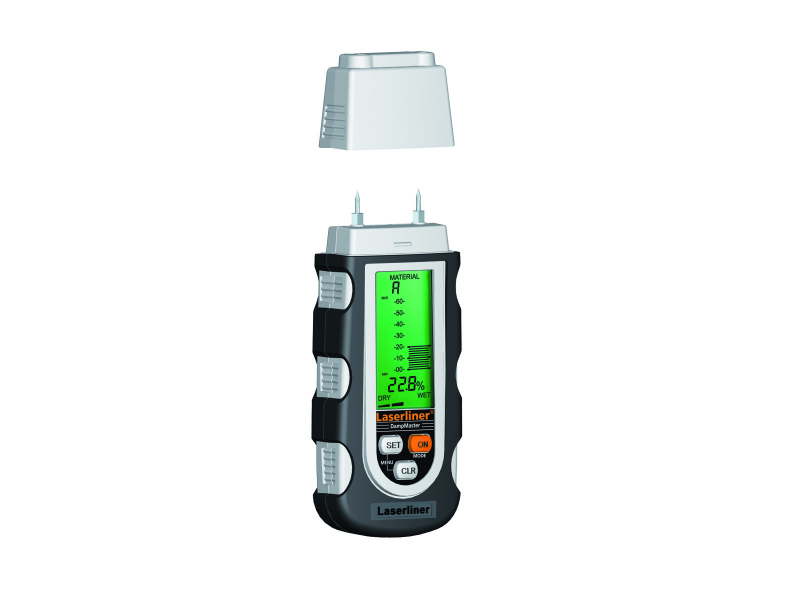 Automatic/Manual temperature compensation: corrects falsified measurement results which would otherwise occur due to differing ambient temperature conditions. Display of measurement value selectable for °C or °F. Self-test function: A reference measurement in the protective cap verifies the accuracy of the measuring device.